Earlier this month, 28-year-old Phoebe Sin (單文柔) and 42-year-old Ruco Chan (陳展鵬) threw a baby shower and revealed they were having a baby girl, nicknamed “Little Piggy.” Currently filming for Jazz Boon’s (文偉鴻) upcoming TVB drama Chinatown <唐人街>, Ruco expressed excitement in welcoming the arrival of their daughter next month, which is just right around the corner. Busy with baby preparations and work, Ruco admits he’s had no time to train his body for Chinatown. However, he did pay special attention to his diet, so that his figure will at least look more robust. Moreover, Jazz revealed that the actors will need to remove their clothes to show off their muscles in the series. For this reason, Joel Chan (陳山聰) has started his extreme training, and did not dare go out during the entire Lunar New year to avoid watching his friends feast. 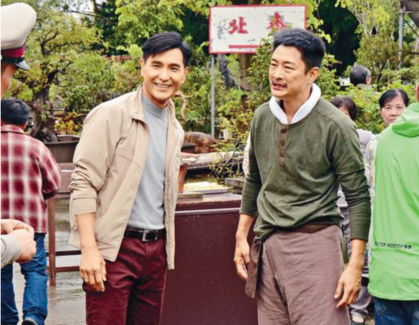 “We see that our female costars Natalie Tong (唐詩詠), Elaine Yiu (姚子羚), Tiffany can eat whatever they want, whereas, I, Philip Ng (伍允龍), and Ruco can only eat bread and chicken breast,” Joel complained. In fact, Tiffany is the only female actress in the drama that does not have any action scenes. She expressed enthusiasm to show the audience another side of her through Chinatown, as her character is very different from her role in Fist Fight <兄弟>.